Valtellina is situated in the north of Lombardy (Italy, Sondrio district), along the Adda river (flowing into the lake of Como), and near the Swiss border. High mountains (Bernina, the highest, 4000 m - 12000 ft), beautiful ski-stations (Bormio the most important, Stelvio for summer-skiing in the glacier), and excellent red wine. Snow in winter, green woods in summer in the National Park of Stelvio. 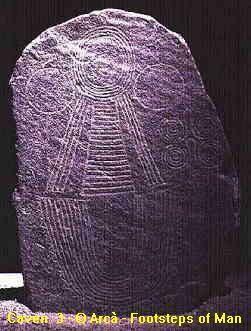 Strictly related to Valcamonica, Valtellina Rock Art is one of the most interesting in the Alps. It is mainly concentrated in two sites: Teglio and Grosio, both in the middle valley. Near Teglio many Copper Age (2700-2200 B.C.) stelae were found, while near the medieval castle of Grosio thousands of engraved figures were discovered in 1970 by Davide Pace in a rock, which he suddenly called the "Rupe Magna" (wich means Big Rock). Most figures here belong to a Bronze - Iron Age (1300-500 B.C.) period.